"By the time we get to 2020, Donald Trump may not even be President," Warren said to voters in Cedar Rapids, Iowa, gathered at the Veterans Memorial Building. "In fact, he may not be a free person." 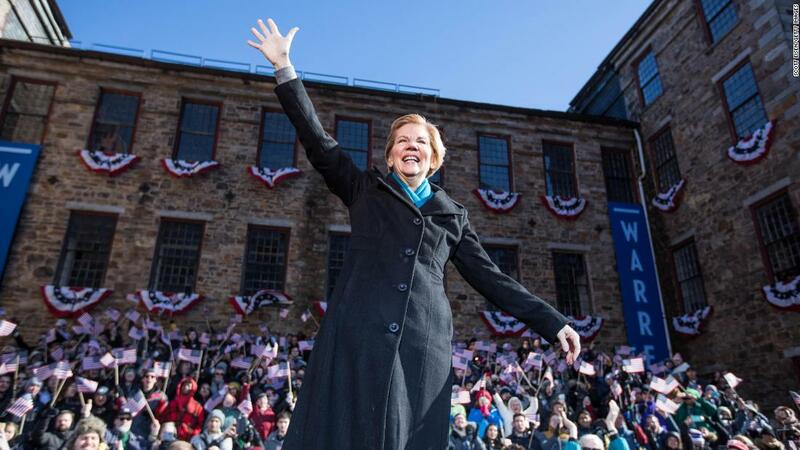 The moment marked a notable shift in tone for Warren, who has been reluctant to take on Trump directly by name since he announced his exploratory campaign on New Year's Eve. "Well come on. How many investigations are there now? It's no longer just the Mueller investigation, "Warren said. "They're everywhere and these are serious investigations, so we'll see what happens." "I do not think there's much doubt of that, "she said. Earlier in the day, the Massachusetts Democrat had lamented in Cedar Rapids that the country was in a" dangerous moment, "and that," what happens in 2020 is going to determine the direction of our nation, the direction of our people. " " Every day, there's a racist tweet, a hateful tweet, something really dark and ugly, "Warren said of Trump. "And what are we, as candidates, as activists, the press, going to do about it? Are we going to let him use those to divide us?" "Here's how I see it: Donald Trump is not the only problem we've got. said. "So, our job as we start rolling into the next election is not just to respond on a daily basis. It's to talk about what we understand is broken in this country, talk about what needs to be done to change it and talk about how we're going to do that, because that is not only how we win, it's how we make the change we need to make. "